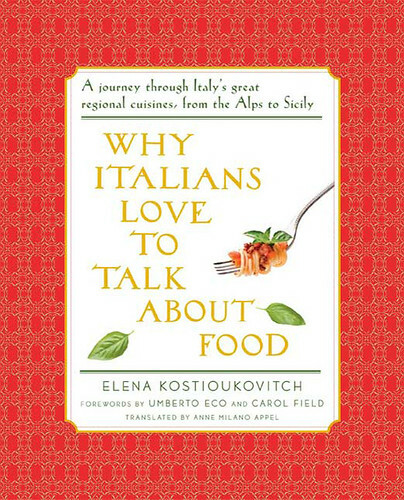 In Elena Kostioukovitch’s preface from the book, “Why Italians Love to Talk About Food” Elena asks, “And why is that you identify particular historic moments with references to food?” The “you” Elena is referencing are the intelligentsia of the Italian landscape (i..e, scholars, journalists, historians, political figures, etc.) but she might as well be talking about the seamstress from Naples or the fisherman from Calabria. You see, for most Italians, food is the identifier of moments (hence the phrase, “Parla come mangi” or Speak the Language of Your Food); it bonds Italians, allows them to experience pleasure, and defines what it means to lead a good life. In America, we consume material or money, while in Italy its inhabitants eat wonderful foods to “live well and soundly” (and it’s the most basic and pure form of consumption). I have to confess, I was fascinated with Kostioukovitch’s book well before I sat to read through the 450 pages. My fascination wasn’t, of course, centered on how a people could disregard economic or material status for the sake of food, but, rather, why anyone would want to chase the good life in any other manner beyond eating well. You see, I learned early only to associate both important events in my life, as well as the mundane, with wonderful food. For example, I associate my first trip as a boy to Italy with the taste of cold pressed extra virgin olive oil from Nonno Latella’s small olive orchard outside of Bagnara Calabra. The olive oil was different from the corn oil my Italian family consumed in the States (we couldn’t afford olive oil in those days) and I quickly identified our trip to Calabria with the green nectar from many years to come. And it wasn’t just olive oil that formed strong references to key events in my life. I still associate, vividly, the smell of frying dough with Christmas Eve (zeppola), boiling pasta water with Sunday mornings (linguine with a rabbit ragu), sun dried tomatoes , provolone cheese, and salami to my parent’s Saturday evening dinner parties, and strong stove top espresso with my mother’s breath. 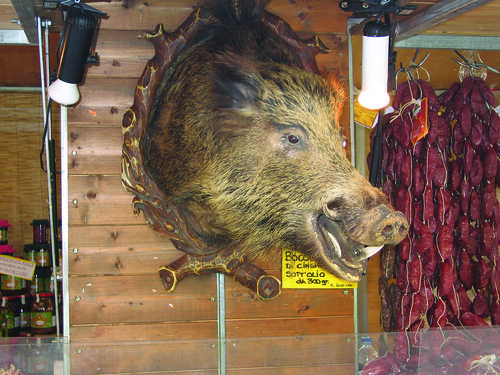 1.In some parts of Calabria, “farmers still read omens from a pig’s entrails when it is taken to slaughter, as the Etruscan haruspices did.” I remember when Nonno Latella used to slaughter a given pig from his stock (about every 2 years or so) and the ritual was very solemn (he didn’t do much reading or perform any rituals; rather he was focused on slaughtering the pig). 2.Calabrian women danced and shouted incantation to drive away evil spirits while kneading dough. Both my Calabrian born grandparents kneaded plenty of dough and I don’t remember them shouting, unless of course I came into the kitchen with dirty hands. However, I do remember Nonna Scordo telling me I had very poor hip movement when I kneaded (she said I had no rhythm or style and she was right). 3.The sign of the cross is traced on loafs of bread before they enter the oven. I’ll have to ask Zia Giovanna if she performs this ritual in her bakery each morning. My hunch is that she may on occasion trace a few crosses, given her belief that one can make major life decisions by placing a single drop of extra virgin olive oil in a bowl of water and then asking the oil to move in a certain manner (when she did this for me as a small child I thought we were playing the Oiju board game; I was slapped quickly and told to sit still). 4.Calabria was part of Magna Craecia (or “Greater Greece” from the eight century B.C. until the third century. The Romans arrived in Calabria 500 years after the Greeks and loved the local wines! After the Roman empire fell, “Calabria was ruled by the Germans, the Goths, the Lombards, the Byzantines, the Normans, the Franks, the Swabians, the Saracens, the Spanish, and the French.” The ‘ndrangheta (Calabrian mafia) begin flexing it’s muscle from 1850 onwards and some say they’ve never loosened their vice grip on the region (a sad fact for the people of Calabria). 5.Cistercians monasteries dominated much of Calabria and their traditions continue to this day, such as practicing an ascetic way of life and deep reliance on agriculture. 7.Calabrians are famous for the diversity of their eggplant crop as well as reliance on fava beans, broad beans, and white beans. 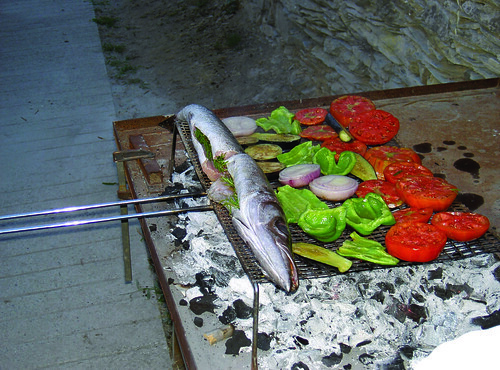 Many fish are consumed from the Tyrrhenian and Ionia seas including swordfish, tuna, sardines, and herring. See my article on 10 Ways to Cook Like An Italian here. – Prize Giveaway includes one (1) copy of Why Italians Love to Talk About Food. – What you need to do to enter: 1. leave a comment under this post on a favorite food memory (from any region of the world) and how you indentify it to a major life moment or event (or even an important person or relative) and 2.sign up for the Scordo.com What’s New Newsletter here (if you’re already a newsletter subsriber than you’ll need to sign up as a fan of Scordo.com on Facebook here). – The contest is open until 12 midnight on 1/30 and a single random user will be picked via Random.org (sorry contest only open to folks from the US given shipping logistics). The winner will be announced immediately on Twitter (so please follow me) and on Scordo.com by 5PM on Monday, 2/1. – Farrar, Straus, and Giroux will send out the book to the single contest winner during the week of 2/1. 1. How did you first get interested in the relationship a typical Italian has with his or her food? It was soon after I began my formal study of Italian language and culture in the University of Moscow. Suddenly I realized that there’s a multitude of topics, either abstract or practical, which are closely linked to a food themes of in the mind of Italian people (and of people of Italian origins of course). An Italian says about his or her mother that ‘she’s as gentle as a bread’, about a friend: ‘we’re like mac and cheese’ (‘cacio con i maccheroni’), and about a nasty person: ‘his pumpkin (head) obviously lacks salt (brains)’. So the more I’ve been reading Italian journalism, poetry, novels, even philosophy and academic books, the more obvious it was: in order to understand Italy and Italians, one definitely should familiarize herself with secrets of their culinary code. 2. What surprised you the most about how Italian interact and relate to food? Yet to say that Italian teenagers today – and especially in big cities – gradually absorb an American-style eating traditions: hamburgers, French fries, hotdogs, Coca-Cola. 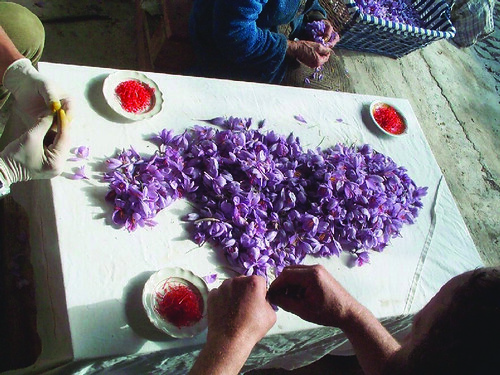 It is possible that in a decade or two Italian culinary rituals and traditions will sink into degradation and will be swept away by a globalization. 3. Americans get a bum wrap for their relationship with food (not to mention the typical American diet); are things changing in the US? Will we ever see regional cooking make a comeback in the US? 4. Your book is not a typical cookbook; was it difficult to talk about food with no references to recipes? 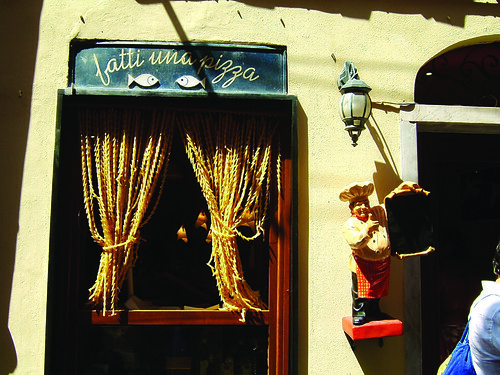 The main subject of my book is not a food in itself, but what Italians SAY about it. To a certain degree, my book is a systematized collection of testimonies of Italians who cook, sell, describe, picture, enjoy and eat Italian food. To put it the other way, my book’s main focus is not on recipes, but on existing general concepts and their roots. 5. Is there a particular regional, Italian, cuisine that you like best? My favorite regional Italian cuisine is definitely that of beautiful Toscana (Tuscany). Its food is full of energy and dynamism essential for Tuscan character. I adore the taste and look of fresh Tuscan products: vegetables, bread, fish, meat, and not to forget about its inimitable wine. I would highly recommend a freshly-made fiorentina beef stake (only a couple of minutes on grill), a cazzimperio salad made of fresh vegetables and special seasoning (vinegar, olive oil, local spices). Tuscan bread is in the base of the world-known bruschettes. As for a local fish courses, made of Tuscan fish, so rich in flavor, my favorite is a delicious cacciucco soup, which according to a local tradition should be prepared of at least five different kinds of fish (as many as Cs in its name, cacciucco), though the more the better. 6. Of the southern regions of Italy, is there a dish or food philosophy that you enjoyed researching or were surprised by? As almost every newcomer, I was amazed by a practice of meridionale (southerners) to eat a wet uncooked fish or seafood just from the net, seasoning it only with salt and lemon juice and washing it down with chilled white local wine. 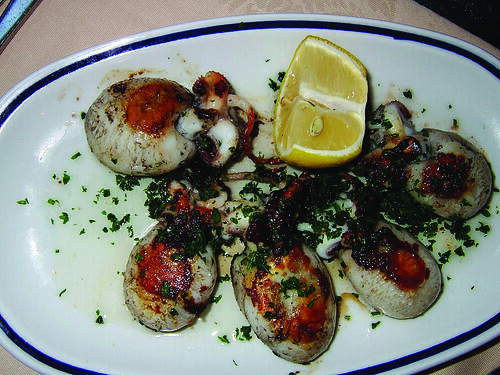 This viand turned to be just as tasty, nutritious and delightful as French oysters accompanied by Chablis wine or Japanese fugu sushi with Japanese beer; the only difference is that the last two are world-famous luxury food, while only few connoisseurs outside Italy know the divine taste of a freshly caught octopus, sea urchin and frutti del mare accompanied by chilled Fiano wine (brought to Apulia by Angevins some 800 years ago). To tell you all the truth, I believe that one should try these delicacies only in Italy, combining a joy of gourmet with other esthetic pleasures Apulia with its magnificent seashore and plenty of old Norman castles offers. When I first started dating my husband we found an Italian restaurant near by. The food was so good. My husband is Italian and brought his family to this place as the place for the bachelor party. I just remember the first time we went there we left almost having to be rolled out the door it was that delicious. Food is LOVE for Italians!!!! My earlies memories as a child revolved around eating and talking about food and cooking it! Happy or sad, eating and talking about food is the best part of being Italian!!! My Nana’s escarole soup on Easter! I make it now in the winter just for comfort. I have such fond memories of cooking with my grandmother. To this day, we enjoy cooking together and she has passed down numerous family recipes. She also always serves melon before a meal. Melon before a meal, that’s great (is it Cantaloupe or honey dew)? Thanks for the comment, Evan. Escarole soup is one of my favorites. Mike, thanks for sharing your memories of Nonna. My grandmother’s southern Chicken and Dumplings were pure comfort food. Mama Nell made thin, slick dumplings, cooked in a delicious chicken broth, then thickened and served with the shredded chicken added back to the pot. Little did I know then how similar they were to homemade pasta. I try, but I still can’t duplicate! On a hiking trip in the Dolomiti, Italian Alps, we had Canaderli en brodo, the most delicate, but dense and cheesy and meaty simultaneously, I have ever had! I have seen recipes for them, but know nothing will compare. I can easily understand how some people live in the mountains and need nothing more. In a similar vain, does anyone here know the series, [Name of Region, IE Piemonte] en bocca? It is a very interesting series, with each region having its own book with its specialties. I have not been able to find them anywhere online. My husband is from Italy and we love to go ‘home’ and visit family – I am blessed with the worlds most precious in laws! There is no way to eat ravioli or even talk about it without thinking of my sister in law Natalina! We sit and watch her make homemade pasta every morning (she never buys commercial) but it is her ravioli that is a work of art! I could forget all about good manners and selfishly devour every piece all on my own! dinner, food and the memories attached to it are the building blocks of my life. Have you tried eBaby or your local library (sometimes you can ask them to purchase books). I come from an Italian background (so my family already loves food). The first time I was reunited with my sisters we had a HUGE lasagna dinner, made with homemade sauce and oh, was it to die for. Now, everytime I eat lasagna I think about that day and it makes me smile. I would love a copy of the book 🙂 Thanks for making this possible. I was the family chef from the age of 12-13, and have always loved baking, cooking and trying new things. It was amazing to leave Iowa and discover the range of flavors not found in traditional home-cooking! All of that said, though – my favorite food memory comes from being a young child and cutting wood in late Winter/early Spring with my father. (We lived on a big farm with two other families – what can I say, they were hippies!) We’d take a package of hot dogs & ketchup along in a bag, keep them suspended in the ice-cold creek that ran through our land, and when it was time for lunch, he’d whittle some sticks so we could cook them in the brush fire we’d assembled. Then he’d put the ketchup on a freshly-cut stump. The sap would get into the ketchup, we’d dunk our grilled dogs and have a quirky picnic, smoke in the air and fresh ‘tree-flavored’ ketchup! It’s one of my favorite memories of him, despite the low-brow nature of our meal. Other than that, I love having cooked for so long to have the confidence to create new dishes. I’m also fortunate that my husband has an adventurous palate! For me it is Cannelloni -I remember being 10 years old and on vacation in Italy with my family- I was so in love with Cannelloni that I ordered them every night for the entire trip every where we went to eat! I can still taste them. I stayed on in Italy, in Acqui Terme (Piemonte), after my husband flew home, to study Italian for a week. It took me a while to get comfortable eating alone. I remember, so well, a lunch of delicious prosciutto and melon and a simple salad, al fresco. This meal was my first time feeling confident, comfortable with my situation as a solo traveler. And the prosciutto and melon–perfection on a plate. I am so glad to find you on Facebook! My favorite food memory… I have so many! As an adult, it is a tie between two experiences abroad. The first was stumbling into a tiny Roman restaurant with no name only to discover it was a place where there is no menu and the beautiful older couple who owned the place fed me course after course of whatever they wanted. Everything was amazing, accompanied by wonderful wines, and I was so full at the end, but so happy. I wish I could find that place again. The second is sitting right next to the water at a seafood restaurant in Crete run by a friend of a friend. I was served a great bottle of Retsina and a platter of whole fried fish. I’ve never eaten fish heads or tails, but I tried and it was wonderful. I am so glad I was willing to take a food risk, because missing out on the fabulous fish would have been a crime. Both of these were points when I was confident and happy abroad, when I was exploring the world and enjoying everything it had to offer. When I came home, they helped me to be more adventurous with my own cooking. My husband and I ate a restaurant recommended by a local in Siena, Italy on our first trip there 11 years ago. We took the first bite of our food and stopped, looked at each other, and at the same time said, “This is the best food I’ve ever tasted!” We eat there every time we go back and still love every minute of the meal. BTW, are you aware that the same book was also published recently in Australia by Picador. 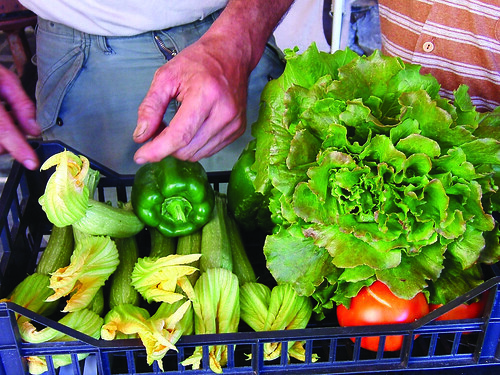 See here http://www.boomerangbooks.com.au/Why-Italians-Love-to-Talk-About-Food/. The cover is different, but all the content is the same I suppose. Elena’s masterpiece also available in Spanish as ‘Por qué a los italianos les gusta hablar de comida’ and has a sound success in Spain and South America. It seems that Italian way of eating conquers the planet! The only thing I do remember is the sign of the cross over whatever dough my mom was making. This was passed down from my mom’s mom and to this day I still remember it.